Victors write the history books and inevitably give short shrift to the losers. In this case, the victors —the unifiers of Italy in the years 1860-70— have described that process as an unstoppable fulfillment of Italian destiny. 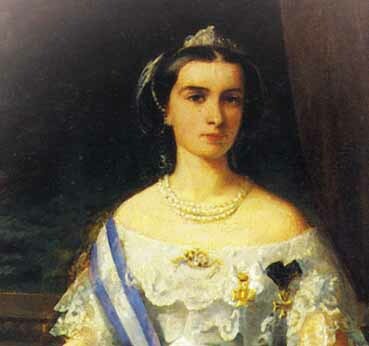 They certainly have not spent much time on one loser, Maria Sophia (1841-1925), the last queen of Naples, a woman whose life reads like one of those novels that young girls, maybe in 1900, used to read furtively in convent boarding schools late at night when the nuns thought everyone was asleep. By the age of 19, Maria Sophia had been a queen, lost her kingdom, rallied soldiers around her in the hopeless defence of a lost cause, and had had men —even her enemies— writing reams of romantic slush about her. She was "the angel of Gaeta" who would "wipe your brow if you were wounded or cradle you in her arms while you died". D'Annunzio called her the "stern little Bavarian eagle" and Marcel Proust spoke of the "soldier queen on the ramparts of Gaeta". She was intelligent, lovely, and headstrong; she could ride a horse and defend herself with a sword. She was everything you could ask for —a combination of Amazon and Angel of Mercy. To avoid bloodshed in the major city of Naples, the king and his army retreated to Gaeta (photo, right) to make what turned out to be a last stand. In late 1860 and early 1861, the forces of Victor Emanuel II lay siege to the stronghold of Gaeta (on Monte Orlando) and eventually overcame the defenders. It was this brief episode that gained Maria Sophia the reputation that stayed with her for the rest of her life. She was tireless in her efforts to rally the defenders, caring for the wounded, and daring the attackers to come within range of the fortress cannon. She refused the chivalrous offer from the attacking general that if she would but mark her residence with a flag, he would make sure not to fire upon it with artillery. Go ahead and shoot at me, she said; I will be where the men are. In one lighthearted episode—if anything at all can relieve the horrors of a four-month siege—she assembled the men on the seaside rampart, had them turn around, pull down their trousers and "moon" the attacker fleet. She was worshipped unto idolatry by her men. Maria Sophia and her husband went into exile in Rome, the capital of what for 1,000 years had been the sizable Vatican States—a large chunk of central Italy. By 1860, however, the "Patrimony of Saint Peter," as it was also called, had been reduced to the city of Rome, itself, as the armies of Victor Emanuel II came down from the north to join up with Garibaldi, the conqueror of the south. Throughout the decade of the 1860s, Rome was a hotbed of what was then called "legitimism", those who resisted the waves of revolution that shook Europe in the mid–1800s, revolution that was eventually responsible for the death of absolutism and the rise of constitutional government throughout the continent. Stopping revolution and returning to an older order had happened before in Europe. After all, Napoleon had been overthrown in 1814, and the subsequent Congress of Vienna had, indeed, restored "legitimacy," returning kingdoms and fortunes to their previous owners. Maybe it could happen again; that thought was no doubt foremost in the minds of the royalist soldiers and adventurers who made up what amounted to a small "foreign legion" in Rome and who gathered around the ex–king and queen of Naples. King Francis set up a government in exile in Rome that enjoyed diplomatic recognition by most European states for a few years as still the legitimate government of the Kingdom of the Two Sicilies. The Bourbons of Naples even had the sympathy and support of the Pope, himself the absolutist king of the Papal States, who had considerable support throughout Europe in his denunciations of the "–isms" of revolution: socialism, communism, republicanism, and anarchism. Indeed, the Pope's own legitimacy had been restored in 1849 when the united armies of Catholic Europe answered his call for help, overthrowing the short-lived Roman Republic and restoring the Papal State. ...The Palazzo Farnese in Rome was, when I knew it in 1863, the refuge of that modern Joan of Arc, the ex-Queen of Naples… She seemed to me the most lovely vision I had ever seen. Her dark hair…reached half way down her back, and seemed ready to burst the wide-meshed net that confined it. Her eyes and color added to the sprightly, bewitching beauty of her face, and her carriage was absolutely the most willowy and graceful I ever saw.… Physically brave and enduring she certainly was, having been fearlessly and boyishly brought up, inured to exercise, accustomed to adventure, and fond of all athletic exercises. But there the dream of Joan of Arc must end; the high moral resolve, the far-seeing grasp of mind, were utterly wanting… So fair a shrine, but so feeble a lamp within! It was a pity to see her thus. She was seldom in Rome, and only came in occasionally to receive her husband’s subjects and the “distinguished foreigners” who wished to be presented to the 'heroine of Gaeta'. Italy in the mid-1890s was not a stable nation. The north was shaken by domestic unrest, including one famous episode in 1898 in Milan in which the army brutally put down what the government feared —or said it feared— was the beginning of an anarchist revolution to destabilize and then fragment the state. (That "revolution" was apparently not much more than a bread riot by the unemployed.) 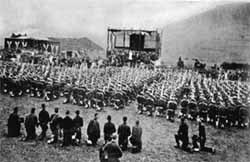 There was, at the time, a large anarchist movement in Europe, those who remembered the failed Paris Commune of 1871 and who were ready for another try. That movement centered in Paris, and many of the anarchists gravitated to the informal court of the ex-queen of Naples. After all, they both had a similar aim: destabilize Italy. It was rumored that Maria Sophia was involved in the assassination of King Humbert in 1900. Italian historian, Arrigo Petacco, (see bibliography, below) recounts that Giovanni Giolitti (1842-1928), Italian Minister of the Interior at the time of the assassination, lent total credence to that idea. Italian government agents had infiltrated the groups of Italian anarchists in northern Italy and Paris and, as well, were well aware of the fact that Maria Sofia presided over her "Bourbon Court in Exile" at the Villa Hamilton in the Neuilly-Sur-Seine quarter of Paris. The Italian government knew the identities of the many anarchists who kept the company of the queen and, as well, knew the names of the various officials of the ex-Kingdom of Naples who still considered themselves to be in her service. That is not proof of anything, of course. The evidence of her complicity is anecdotal. That is, Petacco cites a private letter written to a third party by the prefect of Turin at the time, Guido Guiccioli: "Giolotti told me that the Italian government has proof how the plot at Monza [the city where Umberto was murdered] was carried out. It was inspired by, facilitated by, and paid for by Maria Sofia... ."
Hearsay, your honor! Indeed, if that is so, the defense might claim, why did neither Giolitti nor the Italian government ever present the proof or make a formal accusation? Also, why did no Italian newspaper of the day—jammed for weeks and months with nothing but news and speculation about the assassination—mention the queen's possible involvement? (The only conspiracy debate in the papers was whether the assassin, Gaetano Bresci, acted alone or was part of a larger anarchist plot.) And would the queen—out of some deranged desire for revenge on those who had taken her realm—really conspire to commit murder (!) with the very same people who had murdered her own sister a few years earlier? Thus, the "evidence"—for whatever it is—convinces those who want to be convinced. The wealth and privilege in Maria Sophia's life were, to a certain extent, overshadowed by personal tragedies. Her only child by her husband died in infancy. 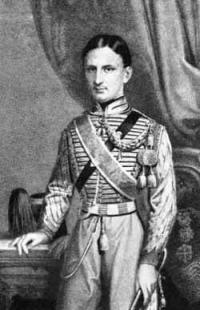 Also, thanks to Armand de Lawayss, a Belgian count and officer in the foreign forces holed up in Rome, she had twins in 1862. Both of them survived and both were taken from her by her all-wise, scandal-conscious royal Bavarian relatives. It is not clear that she ever saw them again, except once or twice, briefly and under supervision. In the late 1890s, her younger sister, Charlotte, died heroically while trying to help others from a burning building. Shortly thereafter, in 1898, her older sister, Elizabeth, the wife of Franz Josef, the last Austrian emperor, as mentioned above, was stabbed to death by an anarchist. Maria Sophia died in Munich in 1925. The January 20, 1925 edition of il Mattino, the largest newspaper in Naples, the ex-capital of her ex-kingdom —65 years (!) after she had ceased to be relevant to the affairs of southern Italy— still saw fit to devote two full columns to her on the front page beneath the banner headline, "Maria Sofia, ex-queen of Naples, is dead." The write-up was almost totally positive, dwelling on the queen's personal courage, anti-traditionalism, and generosity. It pointed out how she visited and consoled Italian prisoners of war interned in Germany during WW I, and how she made sure, to the very end of her life when she, herself, was not well-off financially, to maintain pension payments to the last of her personal servants, a man who had served her in Gaeta 65 years earlier. 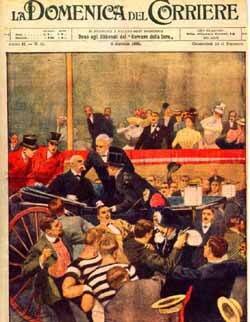 The paper made no mention of any supposed connection between her and Italian anarchists nor supposed involvement in a plot to assassinate King Humbert in 1900. The article, in a single negative note, said that Maria Sophia had been responsible for "organizing banditry in the 1860s in the south." (The term "banditry," as used in that context, may be read as code for "armed resistance by Bourbon troops and sympathizers who refused to surrender to the forces of the new Italy." See this item on banditry in Italy in the 1860s.) 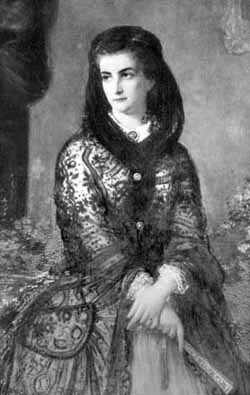 Other than that, the paper praised her with "She was one of those European princesses who, with her great gifts, would have had another destiny but for the dramatic events of her times." Obituaries in many others papers in Europe and America were generally favorable. The New York Times obituary on January 20, 1925, added that Maria Sophia "...distinguished herself in the Franco-Prussian Was as a Sister of Mercy." Also (for the section about her possible involvement with the assassination of King Umberto) see L'anarchico che venne dall'America: storia di Gaetano Bresci e del complotto per uccidere Umberto I (The Anarchist Who Came from America: the story of Gaetano Bresci and the plot to kill Humbert I), by Arrigo Petacco. Mondadori, Milano (2000).